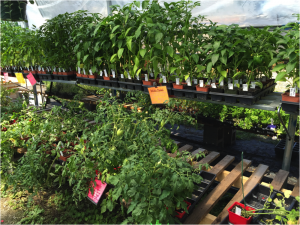 Blueberries, tomatoes and peppers, oh my! Everyone loves a deal and everyone (except cross allergy sufferers and Morticia Addams) love flowers. Deep discounts on all annuals, perennials, fruit trees, rose bushes, and vegetable starts may be had from 9 a.m. to 5 p.m., Friday, July 31 on Northern Flowers’ last day at their Sandpoint locale until next May. If you don’t know where this is, think the bakery, or our town gun, which is right next to Wrenco Arms, which is right next to the flower company’s spot. 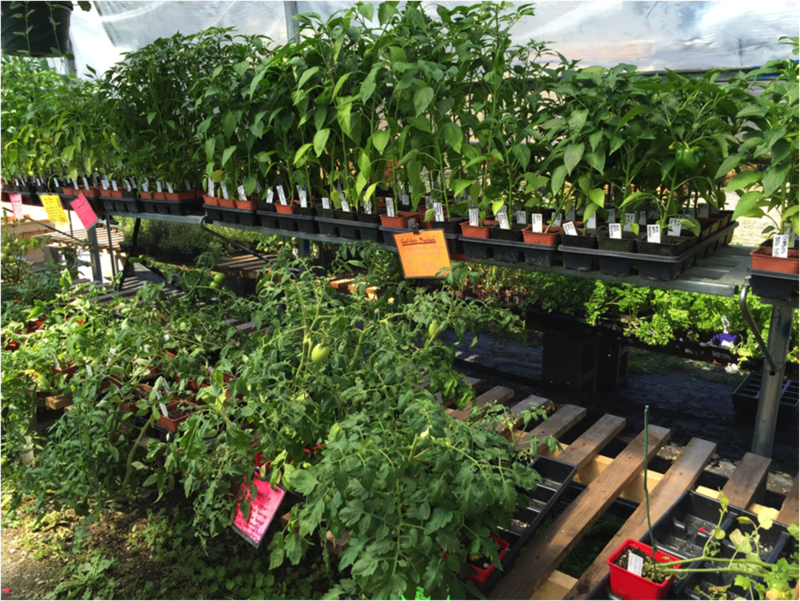 Tomatoes and pepper plants are $1 at Northern Flowers. The stand closes at 5 p.m., Friday until next May. Photo by Susan Drinkard. The tomato and pepper starts at Northern Flowers have much fruit on them and have been $1 for many weeks now. “It’s best to plant these in pots rather than in the garden because you can move them inside if we have colder temperatures,” says Ali Fitzpatrick, who owns the business with her husband, Kief. If you are living on the cheap, you will want to pick huckleberries; however, the reports on hucks are so varied that I cannot give you an accurate report on where to go. When I asked someone I know where she picked her gallons of hucks, she said, “in the mountains.” Asking folks where they go to pick their huckleberries is like asking how much money they make. It’s just not appropriate. I do know that if you want to save money on gas and pick delicious and nutritious blueberries, there’s a way to fill your freezer without breaking the bank. First of all, there are some factoids to relay. If you don’t know the positive attributes of blueberries, you must have lived in a stump for the past few years, but let’s review: Blueberries combat free radicals and improve memory; they have anti-cancer properties and regulate blood sugar; they are important for eye health and have cardiovascular benefits. Eat 100-150 berries per day, which is equivalent to one cup, and you’ll outlive Tippi Hedren of Hitchcock’s “The Birds’” fame, or Mr. Muscular Dystrophy, Jerry Lewis; the combined ages of the two equal 174. It took only 25 minutes for Jill Price to pick a gallon of blueberries at a local farm. Photo by Susan Drinkard. The bushes are chock-full of luscious berries at the local farms. I picked a few days ago at one of the farms and went away with a gallon of Mama Cass-sized berries that ended up at three different social events, all for a mere $13. Shingle Mill Blueberry Farm, just off Highway 200 as you are driving past Kootenai, is owned and operated by the Omodt family. Fred Omodt says the Drapers, Blue Crops and Rekas are $3 per pound. Ask him if there is still $2 per pound specials on the Dukes and Early Blues. 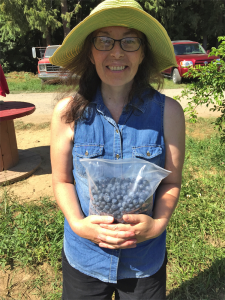 When you are picking berries at Shingle Mill Blueberry Farm, you are encouraged to help prevent disease by picking up the grounded berries; these are given to a women’s center. Riley Creek Blueberry Farm is about 12 miles west of Sandpoint. Open from 7 a.m. to 7 p.m., Stan Urmann and his family, wife Anita, and daughter, Whitney, have a unique setup: It’s an honor system at Riley Creek. You weigh the berries you pick and you put your money in the box. Urmann does not recommend washing the berries before eating them because it takes off anti-oxidants when you do so. Presently they have Blue Crop, Northland and Berkeley blueberries. “Some people like the more tart berries and that would be a Blue Crop. The Berkeleys have a distinguished taste and are a little bigger than other berries, but they don’t have a long shelf life. Whatever your preference, the cost is $2.50 per pound and they can be purchased already picked for $17 a gallon. For high-quality berries that are locally grown and a good deal at $2 to $3 per pound, take your family to the berry farms and then fill your freezer. Next story So you wanna build something?